We've driven the dynamic new BMW Z4 in range-topping, Porsche-bothering M40i guise. BMW reckons its new GT is impressive enough to warrant rejuvenating the 8 Series badge. Well, is it? Four-wheel drive and forced induction it might use, but the latest BMW supersaloon feels like a true M5 legend. 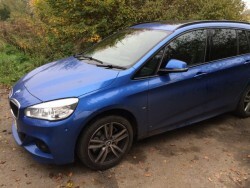 Our newest addition to the long term test fleet is this BMW 2 Series Active Tourer. Adam Towler is the 'owner'.